I’ve recently returned from the Avignon Festival where I’m sure I saw more shows with supertitles than ever before. As a supertitle artist myself and having just finished a translation of a book on supertitles for the theatre, my experience in Avignon has made me even more aware of the important role supertitles must play even if the challenge of reading them can be frustrating and annoying, to say the least. Ibsen Huis, by Simon Stone, for example, an epic four-hour piece in Dutch, was especially provocative. 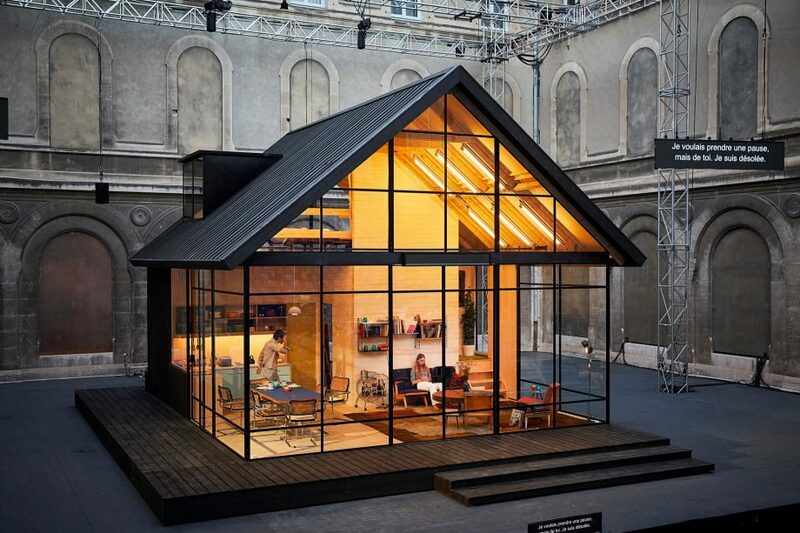 The play, a social drama filled with characters that hint at connections with Ibsen’s well-known characters, takes place in a vacation house originally designed and built in the 1960s by Cees Keekman, a famous architect. The house is a masterpiece of glass and wood, with its gigantic windows looking out over the water. 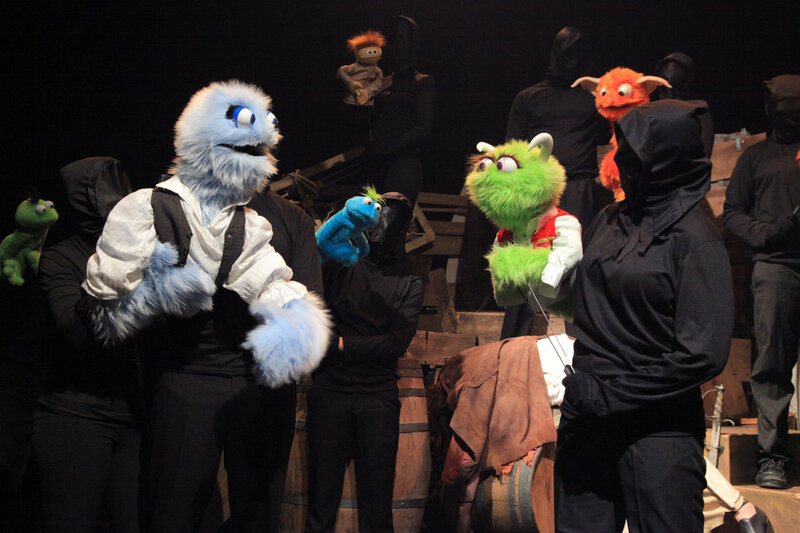 Cees’ extended family comes and goes, some twenty different members played by eleven actors, who masterfully perform their roles as the set revolves to go back in time and return to the present. At one point during intermission, technicians completely dismount the house and transform it into a house that will go up in flames in the end. Theirs is a truly unhappy family. It’s not only that they are nasty and mean-spirited, to say the least. They are the product of Cees’ evil deeds of which we learn as the narrative evolves. Their lives and relationships are anything but simple. Conversations are not easy to follow, even though the supertitles are easily accessible. Ultimately it was best to just sit back and admire the superb acting of these members of the Toneelgroep Amsterdam (Ivo van Hove’s company) and the fascinating machinery involved in creating the multiple stories as family secrets are revealed and lives are lost. 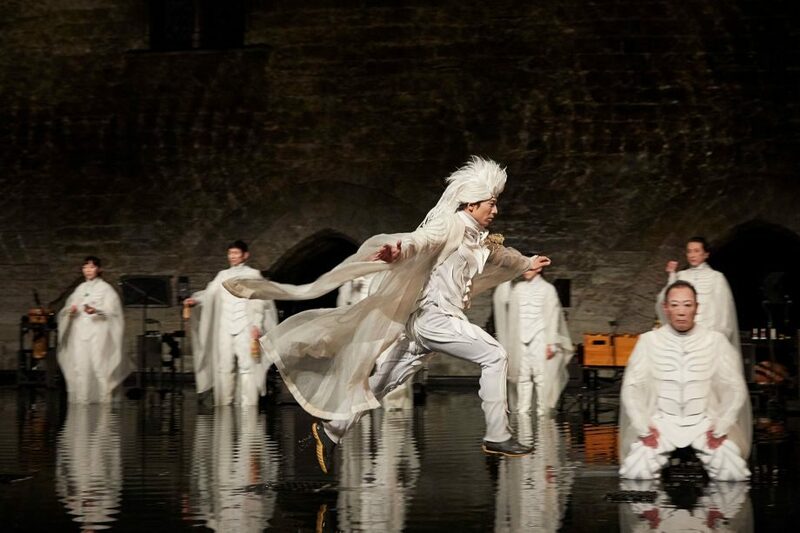 The exquisite Japanese production of Sophocles’ Antigone by Satoshi Miyagi and company offered a beautiful theatre of fire and water, in Japanese of course, with titles in French, projected on the 14th-century wall of the Honor Court in the Pope’s palace. Here, the supertitles played a less intrusive part in the telling of this tragic tale of war, death, and sacrifice than in other shows. They were few and far between but sufficient to give the audience enough information to add to our knowledge of the story of the two rival brothers who kill each other and the sisters who fight to give a proper burial to the one who has been left to rot out in the open. 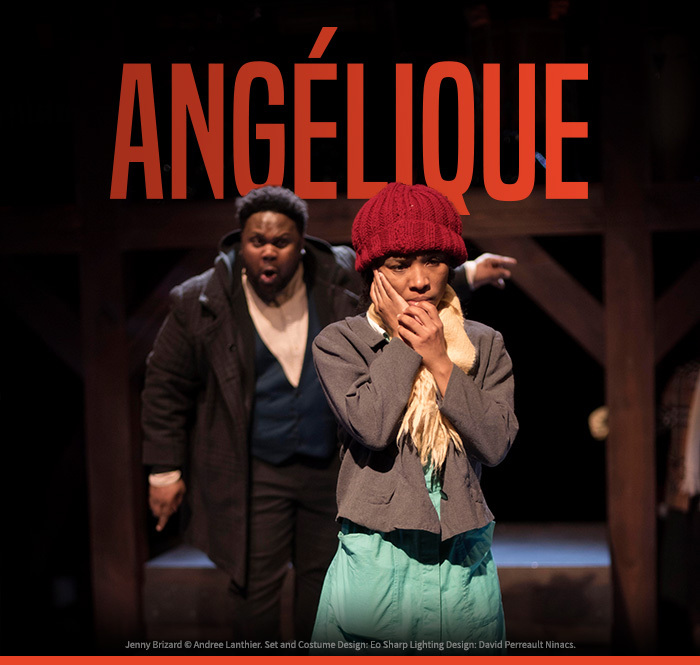 To add to these titles, the performance begins with an amusing resume of the Antigone story, addressed directly to the audience by the enchanting Satoshi Miyagi in French. 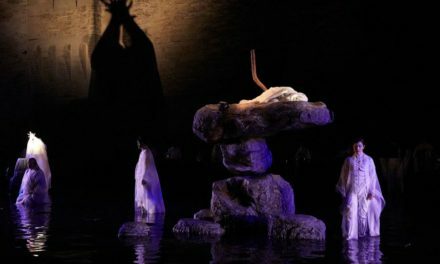 As the play opens, a procession of figures in white kimono-style robes crossing slowly through the water, carry candles in tribute to the souls of the dead. Huge boulders stacked on top of each other or lying around the stage, remind us that we are perhaps in a desert-like oasis somewhere. Each main character is played by two actors; one narrates the lines while the other silently makes appropriately ritualistic gestures. Their bodies are thus separated from their voices. We don’t need to know what they are saying so much as we are immersed in the power of Miyaghi’s contemporary use of traditional Japanese forms, Nô, Kabuki and Bunraku, to encompass the tragic dimensions of these familiar figures, on their journey to the realm of Hades. 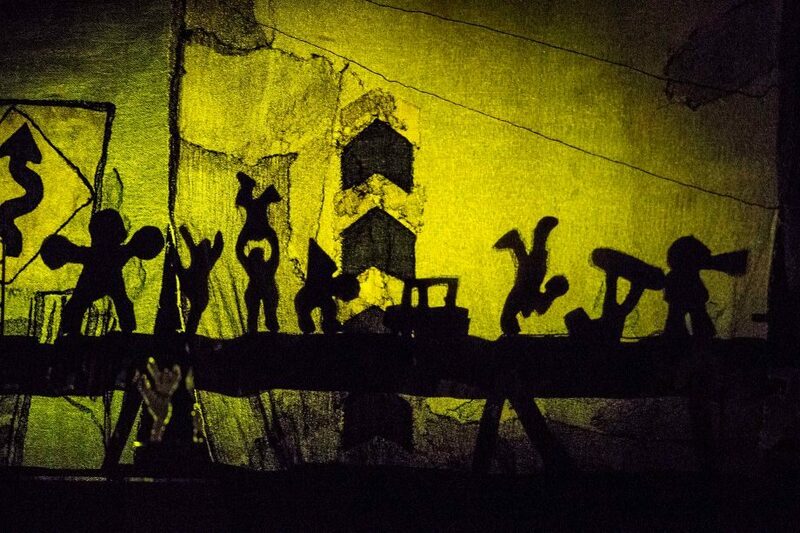 Gigantic silhouettes, for example, borrowed from Indonesian shadow puppet theatre, cover the back wall, effectively capture the enormity of Creon’s realization that through his own folly, he has lost his son. British theatre artist Katie Mitchel tackled Genet’s Les Bonnes (The Maids), in De Meiden, with superb actors from the Toneelgroep from Amsterdam. In her version of Genet’s masterpiece, Claire and Solange are Polish immigrants working for Madame (played as a male transvestite). The maids deliver their lines in Polish and Dutch, with French supertitles. When they speak Dutch the supertitles are white. When they switch to Polish the supertitles are blue. It did not seem to matter which color they were, they were equally difficult to follow since the maids speak quickly as they rush around Madame’s luxury apartment, trying on her dresses and makeup and taking pictures of everything so they can put things back where they found them. Their performance is flawless, the all-white set is a stunning replica of a wealthy person’s bedroom in today’s Amsterdam, but something is missing, a sense of ceremony so vital to Genet’s theatre, perhaps. 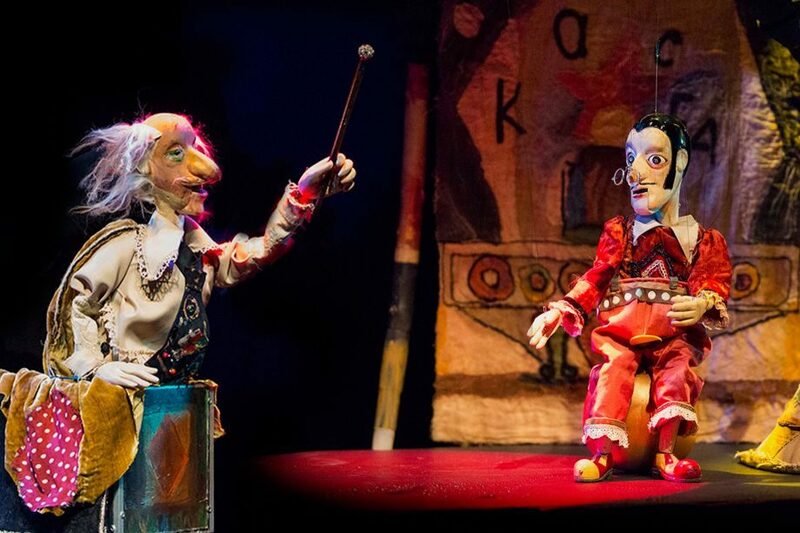 The delightful puppet show Ramona by well-known Georgian puppet master Rezo Gabriadze, tells a love story of two locomotives that rarely cross paths as they travel in different directions on the railways somewhere in the USSR. Their sad tale of separation and longing was beautifully played out on a small stage in the Maison Jean Vilar, available to only a few privileged spectators. Performed in Georgian and Russian with French supertitles, it was tempting to just follow the deft manipulations of these master puppeteers rather than look up constantly to see what the station master, the circus performers, tightrope walkers, and acrobats encountered along the way are saying. This would have taken away from the chance to admire the delicate workmanship of these enchanting wooden figures, with their fanciful costumes and endearing facial expressions. For once, perhaps, the supertitles weren’t really necessary to fully appreciate Gabriadze’s message of the power of love to withstand the absence of the loved one. Saigon, by Caroline Guiela Nguyen, a very moving four hours about a group composed of Vietnamese immigrants who left Saigon in 1956 after Dien Bien Phu and who wish to return to Ho chi Minh-Ville forty years later, French people of Vietnamese descent, and others some of whom have never learned to speak Vietnamese, offers audiences a rare opportunity to learn first-hand what it means to be exiled, caught between cultures on many levels. Saigon takes the naturalistic form of a TV series, with instalments from the past as well as the present. A large cast of characters played by professional as well as amateur actors gathers at Madame Anh Tran Nghia‘s Vietnamese restaurant in Paris. Sometimes they speak Vietnamese, at others they speak French but with a heavy Vietnamese accent, at others just French. Sometimes it was hard to understand them, even though there were a few supertitles but what was especially interesting to me was the cultural mixture of languages and customs of these representatives of this “wounded land of Saigon” so beautifully captured in Caroline Guiela Nguyen’s play. 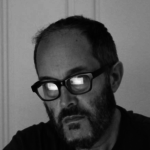 As an admirer of the work of Portuguese writer/director/performer Tiago Rodrigues, I was looking forward to seeing his latest play Sopro (Breath), a piece that explores the soul of the theatre when nothing is left but the prompter, the guardian of memory. 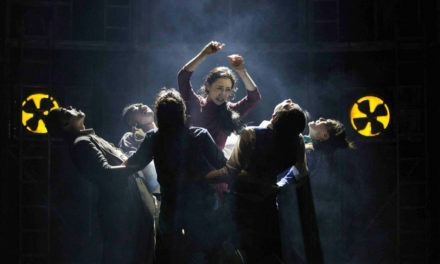 To honour the importance of this role, Tiago persuaded Cristina Vidal, who has been the prompter at the Teatro Nacional Dona Maria II for 25 years – Tiago has been the director of this national theatre since 2015 – to appear on the stage with a company of actors who seem in need of her services. For the first time in her career, she is not hidden offstage, but rather she gives the actors their lines in full view of the audience. On a set referencing an abandoned theatre in ruins with crumbling walls, and grass growing between the pavement stones, the spirits of a once vital theatre are conjured. Unfortunately, the supertitles were so light that I could barely read them. This was a great disappointment especially since the text was vital to understanding the show, which I’m told was quite remarkable. I was not alone in having trouble reading the supertitles, I learned later. For me, Sopro was yet another example of the power and need for expertly created supertitles in order to have the full experience of an artist’s vision. Without these fleeting written words to help us complete our experience of what was surely one of the best plays in Avignon, some of us went away disappointed. I could not help but see the irony in Tiago’s choice to feature a prompter who whispers lines to actors when they have left something out or forgotten their responses, when some of us in the audience wished that we could have benefited from someone whispering in our ears as to the meaning of such a rich text. I learned too late that special Smart Glasses were available to project multilingual supertitles via augmented reality, but they had to be ordered in advance. So much was lost for me in this experience but generally speaking, loss is inevitable even when the supertitles are legible. But what is lost? As Supertitles in the theatre: A Guide – the book I translated – tells it, the art of writing a title consists in constantly weighing what will be the least painful loss. What should you take out and what should you leave in? You have to remove the “fat” when the best is often the “fat,” as the Guide tells us. Yes, even the word translation means betrayal. Without supertitles, however frustrating or poorly made they may be at times, the riches of the international theatre would be unavailable to us. 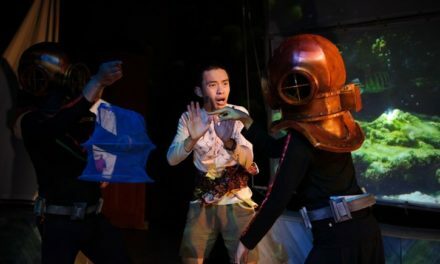 We would be living in an insular world devoid of diversity and exclusion, and audiences would be limited to those speaking the language of the play. What matters is that thanks to their labor, cultures can now be connected in a way that was inconceivable some sixty years ago. What is happening today is so much better than the days when we would go to a play in a foreign language and be given headphones that would allow our neighbours to hear the text across several rows of seats as we struggled to keep up. That was in 1960. Hats off therefore to “titlers” as we’re sometimes called. We are underappreciated in so many ways but we know that it is worth it to help a playwright to be better known abroad.